Staffing model always foresees the requirements of our customers and specialists. Our “Looking ahead of the curve” staffing model constantly anticipates the needs of our clients and workers. Keeping close contact with our partners or (clients) we keep our finger on the pulse of the ever changing ebb and flow of our clients’ needs. Assimilating our clients Human Resources department allows us to provide a very organic feeling and effective staffing partnership. 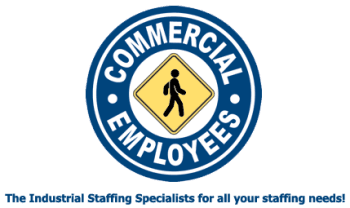 Commercial Employees was founded in 2003 by Gregory G. Madler after working 12 years in the staffing industry for a multiple of fortune 500 temporary staffing firms. After seeing and learning a number of different staffing models and company cultures we felt that we could build a better mouse trap. Taking all of the best practices we have learned and weeding out the flaws, we developed the, “Looking ahead of the curve” model. Twelve years of seeing what worked and what didn’t gave us a firm grasp on how to move forward. For our employees and candidates we provide clear and understandable information about what they can expect and achieve. We take great care in communication with our associates in the field as it pertains to any aspect of employment. Creating positive and respectful culture for our associates in the field goes a long way to creating a trifocal win for our associates, our partners and Commercial Employees Inc.
“It only works if it is a mutually beneficial relationship all around”. Commercial Employees offers and on-site staffing approach and a branch staffing model. If you are looking for talent please give us a call at 724-969-4355.